The Chapter Library of St George’s College is home to approximately 6000 rare books, which have been collected by the Deans and Canons of Windsor over the centuries since the College’s foundation in 1348. The library’s contents cover an enormous variety of subjects and some of its titles are exceptionally well-known, while others are more obscure. In the case of the book shown here [SGC RBK V.89], it is not its text that makes it instantly fascinating, but its binding. Many of the books in the Chapter Library have retained their original binding, but few others are of such a pedigree, for this book – as the design on its cover was clearly meant to indicate – was once the property of Katherine of Aragon. As the first of Henry VIII’s famous six wives, Katherine was Queen of England between 1509 and 1533. At the centre of this binding is the English Royal coat of arms, surrounded by the band and motto of the Most Noble Order of the Garter. The Order of the Garter had its spiritual home here at St George’s Chapel, Windsor and, as king, Henry VIII was its Sovereign, with the power to appoint (and dismiss) its members. 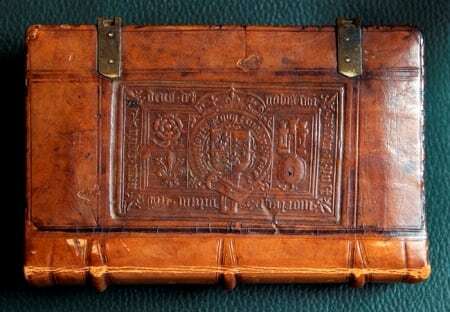 The symbols to the left of the Garter on this binding are also indications of the English Royal connection: the Tudor Rose represented King Henry VIII’s combined Lancastrian and Yorkist ancestry, and thus his right to the throne. The Fleur de Lis was used in the royal arms of England, and later Great Britain, from the reign of Edward III until the nineteenth century, representing the English monarchs’ claim to the French throne. The symbols on the right hand side are those of Katherine’s own heritage. The castle represents Castile, a Spanish territory that was united with Aragon through the marriage of Katherine’s parents, the Infanta Isabella of Castile and Ferdinand II of Aragon, in 1469. Below this can be seen an image of a pomegranate, symbol of the Spanish city of Granada but also Katherine’s personal heraldic symbol. When she married Henry VIII it was accepted into English heraldry and pomegranates can be seen carved into the wooden oriel window that Henry had built for Katherine to watch services from in St George’s Chapel. It is also said that people still leave pomegranates with flowers alongside her tomb in Peterborough Cathedral. The title of the book is De concordia et discordia in humano genere (‘On concord and discord in humankind’) by the scholar and humanist Joannes Ludovicus Vives. Himself a Spaniard by birth (1493 in Valencia), Vives would have known Katherine of Aragon personally. During the 1520s he spent some years in the English court of King Henry VIII, where he acted as tutor to Henry and Katherine’s daughter Mary, later Queen Mary I of England. Another of his works, De institutione feminae Christinae, ‘On the instruction of a Christian woman’, was allegedly written for the education of the Princess Mary and was dedicated to Queen Katherine. Katherine of Aragon’s bound copy of De concordia et discordia [SGC RBK V.89] can currently be seen on display in the South Quire Aisle of St George’s Chapel as part of an exhibition about Henry VIII and Windsor. The exhibition may be visited from Monday to Saturday from 10am to 4pm when the Chapel is open to visitors. Windsor Castle admission charges apply.